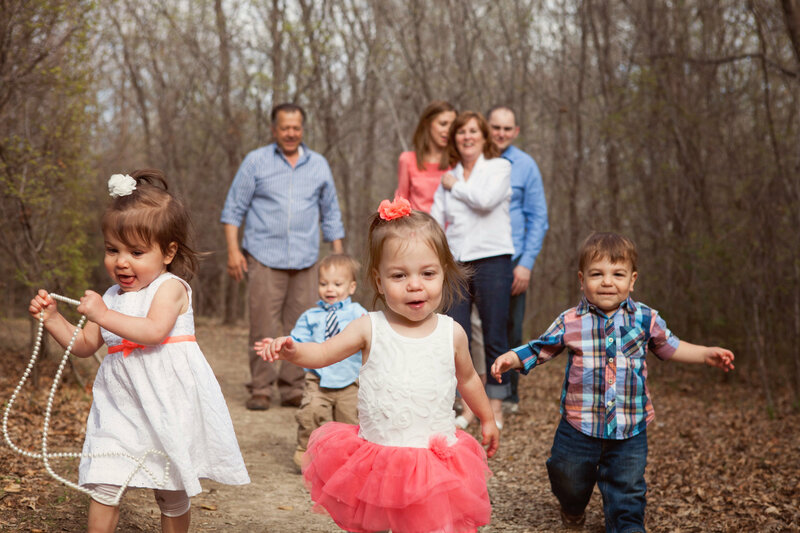 I feel very fortunate to have the Bell family nearby so that we can share the experience of parenting quadruplets and the babies can be raised with other quadruplets. It normalizes the experience so much. We’ve taken turns hosting play dates in our homes, and it’s always been great. 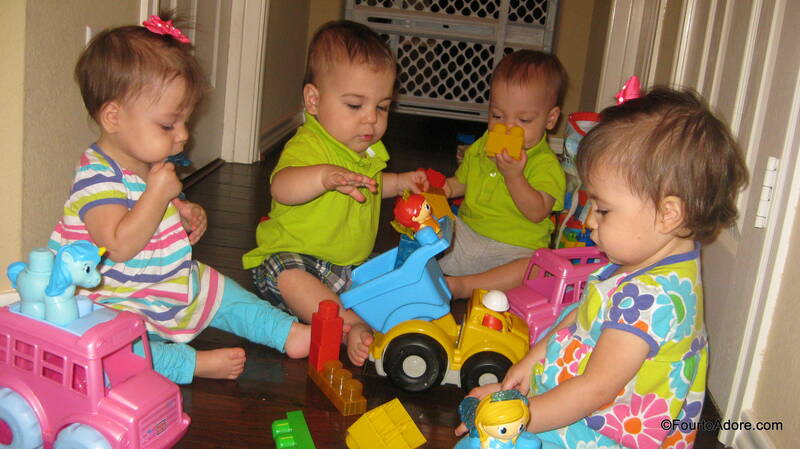 Now that we have toddlers, Amber suggested taking the quads for a play date away from home. Naturally, any type of outing means a great deal of planning and W-O-R-K, but I thought it was brilliant. I sequestered the assistance of my friend, Kristin, on a day when Amber’s nanny was available. Thus, four of us set out to take eight babies to Legoland. In case you ever wondered, this is what four twin strollers filled with eight babies looks like. 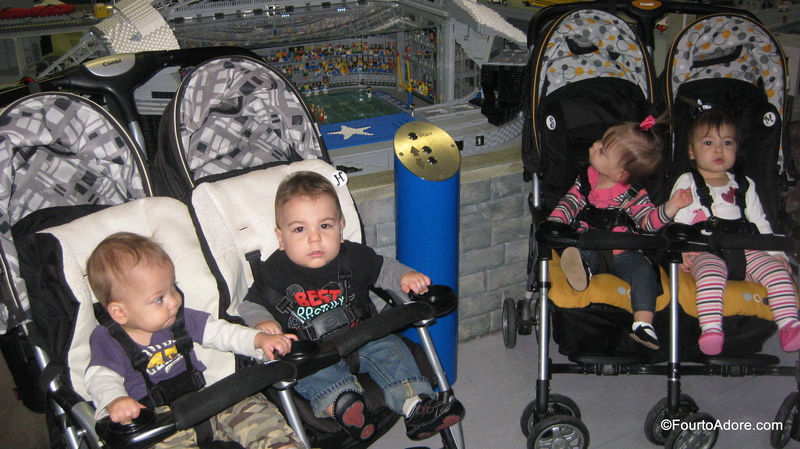 Amber said it looked like a Combi convention since we have four of the same model stroller. Maybe the two of us can start hosting “Combi Cons”. Since we were all Leogland rookies, no one knew quite what to expect. After purchasing our tickets, the 12 of us were greeted by electronic doors leading us into a Lego factory where a “Professor” greeted us and explained how Legos are made. While the babies probably had no idea what the Professor was saying, they seemed to enjoy watching Legos progress through the factory, except when the batch spilled into a bucket causing a commotion. Following our tour, we were led to an area of low light surrounded by several long ramps cordoned off by ropes. There, a zealous pair enthusiastically greeted us and directed us to park our strollers in the “stroller park” as if this was the protocol for entry. I’m sure the four adults in our group stared at this pair gobsmacked trying to work out how we’d manage to park four twin strollers and lead eight babies (with various levels of mobility) up a series of ramps. Somehow we learned the ramps lead to a ride so I inquired whether it was appropriate for babies to which they replied, “everyone is welcome”. Still the four adults were hesitant to 1. park our strollers 2. heave all the baby gear 3. lead eight babies up ramps 4. take babies on a mysterious ride. About twenty questions in we knew it would be startling for the little ones so we opted out. Apparently each Legoland boasts a miniature of the city where it is located. We were thoroughly impressed with the Lego version of Dallas-Fort Worth, which was complete with Cowboy Stadium, Southfork Ranch, and my favorite, Reunion Tower. 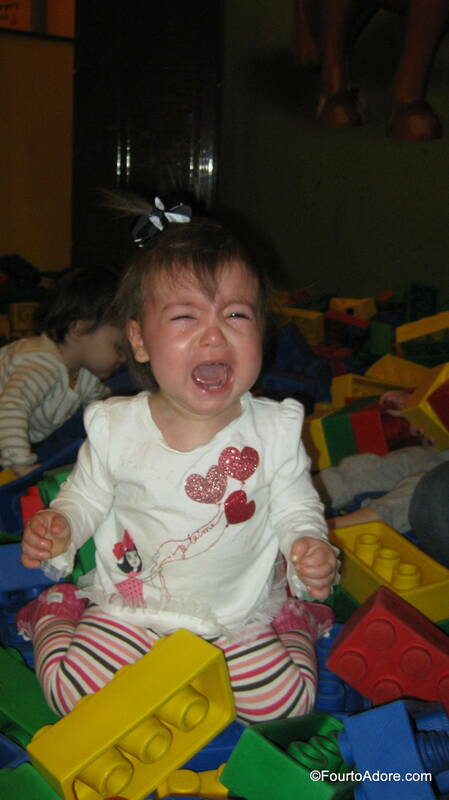 While looking at Legos is interesting, it doesn’t help harness toddler energy. Amber and I both snapped pictures of the babies next to Cowboy Stadium for the Quad Fathers. Within the play area, we stumbled upon a giant pit of rubber Legos. In multiples fashion, we overtook this area by encircling the pit with our strollers and dumping eight babies inside. 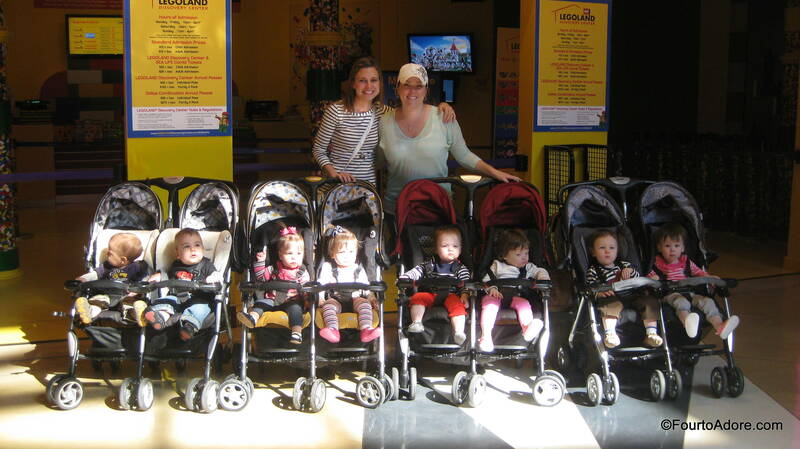 Our gaggle of babies undoubtedly confused the other patrons. Most people presumed we were a twin play group, which was probably far less novel than when they realized it was two sets of quads. Amber’s nanny dared me to claim all eight as octuplets, but there’s no way I could have done that with a straight face. It was a humorous thought. I think eight babies in a Lego pit is about capacity. Someone was not keen on the Lego pit. Thankfully this lasted only momentarily. I’m not sure that Kristin knew what she signed up for, but she was an amazing help during this excursion. 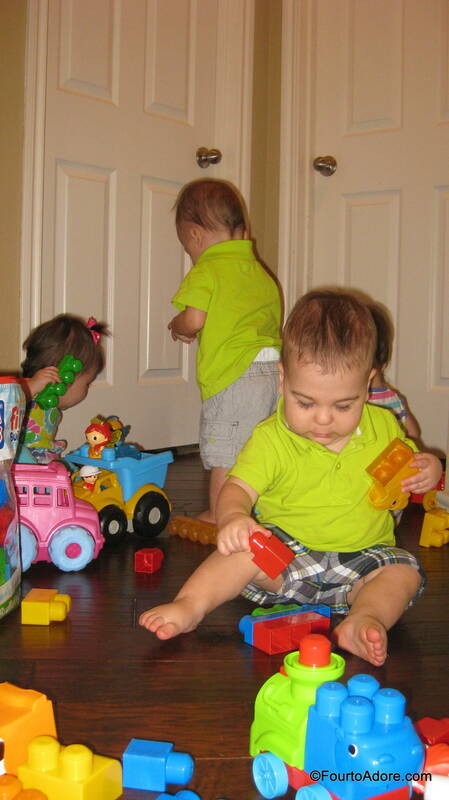 Everyone had an opportunity to go out with just one sibling to explore and practice mobility. I was especially proud of Sydney who finally began standing unassisted. 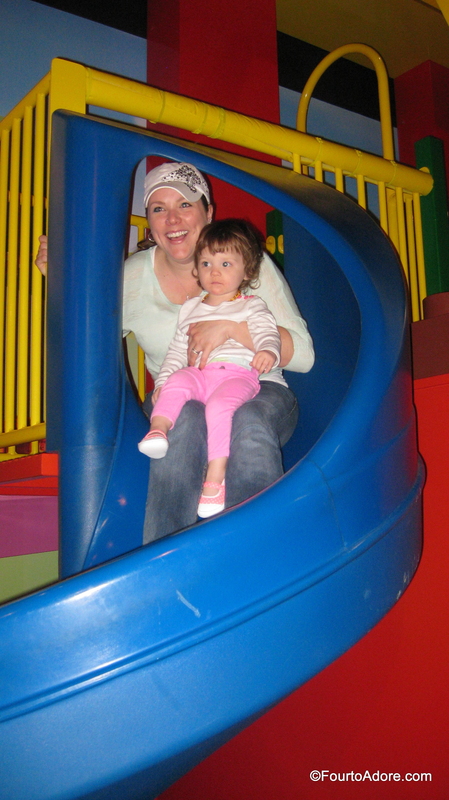 Each of the babies had a turn on the spiral slide with their mommy. I snapped a picture of Amber & Logan. The babies did really well handling the small Leogs and attempted connecting them. They all tasted said small Legos, but we tried to ignore the thought of germ infestation. I was extremely proud of all of the babies. They explored their surroundings and remained calm during our stay with only a few exceptions. After about an hour, the adults were totally drained so we gathered our troops and headed to the food court. By that time, the babies were so exhausted, a few of them nodded off during lunch. It was a successful adventure for all! 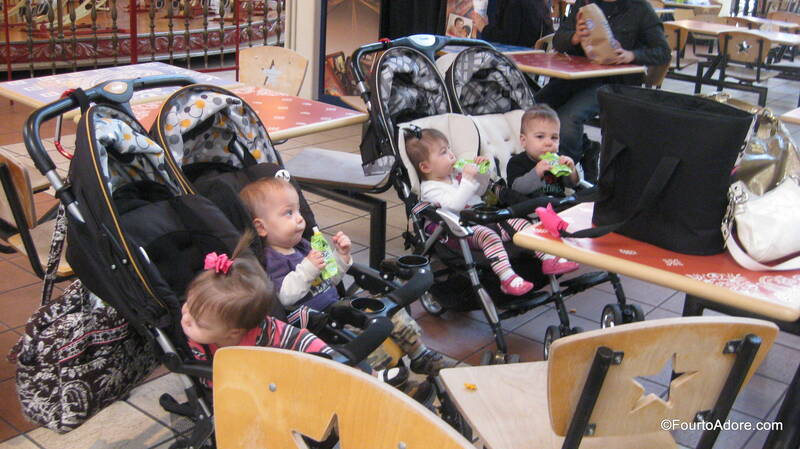 This is how you feed eight babies in a food court. No need for strollers- simply dish out finger foods and strap sippy cups onto the stroller. I love that these strollers have three snack catch/ drink holders per stroller. (Sydney is craning her neck to see the carousel behind the strollers). 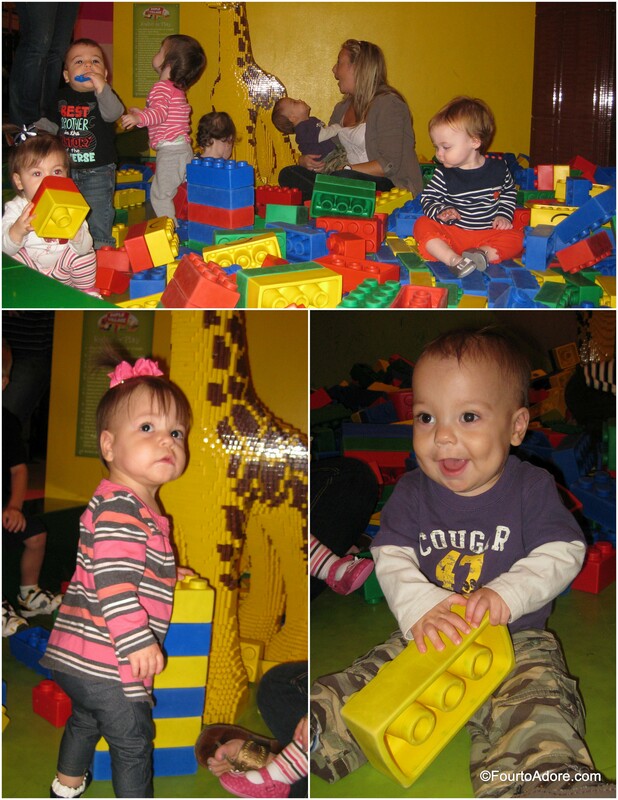 Since the babies seemed more interested in Legos than ever before, we had a little Legoland experience at home today. I gated off our hallway, shut the doors and put only Legos Mega Blocks and their accessories out. This kept the babies occupied nearly 30 minutes. Today, Harper worked very hard to attach blocks together. After our DIY Legoland, we worked on putting everything back in the bag. The babies did pretty well with this, but once all pieces were in the bag they tried to take them back out. 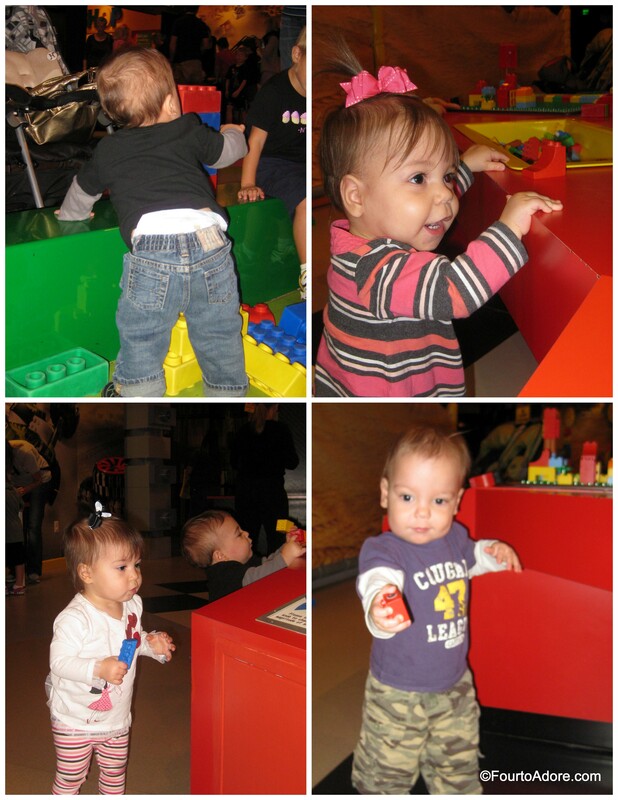 Where is your favorite place to take toddlers? Fun day!! I can’t believe they are TODDLERS!!!! Me neither! We need a quatrip play date soon. All these busy babies! It was a good outing! 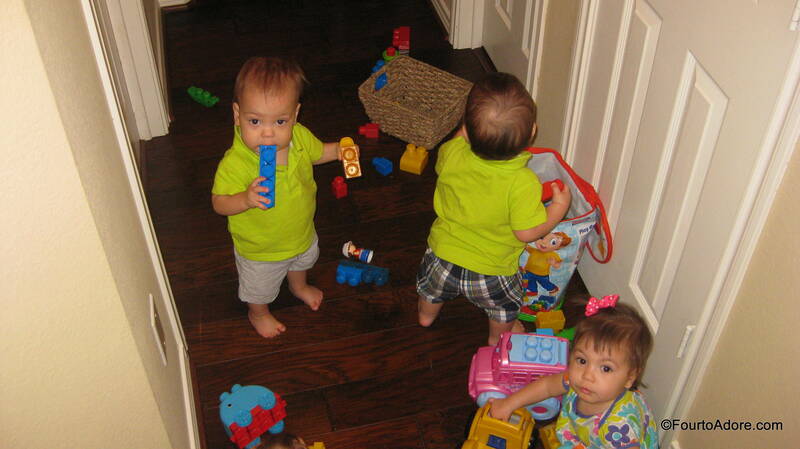 Loved that you did all lego-like toys in the hallway. I think we are often more inventive then we even realize—everything holds possibility! We’ll have to come up with another adventure to go on soon, something contained, ha! It was a total success! I’m so glad you suggested it. When we go new places, we are def more creative. Amber, that was like a giant pack and play! So creative! And kuddos to you for braving LegoLand with 8 babies. The picture of the strollers lined up takes my breath away. Lol, it was like a giant pack n play! The visual of eight babies lined up is incredible, it was a reminder of the miracles they are. That’s a great suggestion! FREE is always a winner. My mom used to take us to the library for story time and I still have fond memories. I may need a few reinforcements for that one so we don’t disrupt the serenity of a library too much, lol. Oh my goodness your babies are so beautiful! We’ve never been to a Legoland, but I’m thinking my 5 year old would love it. All my boys have loved Legos and still do. There’s something special about 4 kids 5-15 years old, all playing together. Thank you! Your boys would love legoland!!! It’s a bit pricey so I would check for coupons or specials first. Thankfully all the babies were still free.